TAMPA BAY, Fla. (August 3, 2017) – St. Pete Art & Fashion Week (SPAFW) is a series of social events, art shows and runway fashion in St. Petersburg. This year, the event is set to take place September 13th– 16th at unique venues throughout the city. The 2017 event will be Pop Art themed and feature displays by local artists and fashion designers. The St. Pete Festival of the Arts will continue to support the Warehouse Arts District Association as its beneficiary. The nonprofit, WADA, has launched an innovative plan to expand and preserve a growing artists’ colony within an industrial warehouse district in St. Petersburg. The 50,000-square-foot facility, named the ArtsXchange, will offer an affordable working space for artists of all mediums from paint to metal work to sculpture. The Warehouse Arts District is currently fundraising for this project. Over 400 artists are on the waiting list such as photographers, painters, graphic artists, metal workers, sculptors and other mixed media artists with 24 artists scheduled to lease space in September 2017. SPAFW is proud to be supporting this project. The festivities will begin with the Opening Night VIP party at the Raw Studios. Guests will enjoy cocktails and hors d’ oeuvres and get a chance to mix and mingle SPAFW artists, fashion designers and sponsors. The week continues with the collaborative “Making if the Runway” event at the Creative Courtyard. There will be a special event called the Art Inspired Trunk Show, similar to our past years except with a designer Trunk Show encouraging attendees to shop local. St. Pete Art & Fashion Week will conclude with the main event, a runway fashion show at the St. Petersburg Women’s Club. Admission to each of the events varies from $0 – $25 for general admission. Tickets are available online for discounted prices prior to the event week. A limited number of VIP wristbands are available for $79. The wristbands guarantee access to all events throughout the week including the VIP party on Wednesday evening, which is reserved for guests with wristbands only, along with front row seating at Saturday’s main event. “St. Petersburg is home to so many talented individuals; a destination for the creative soul. 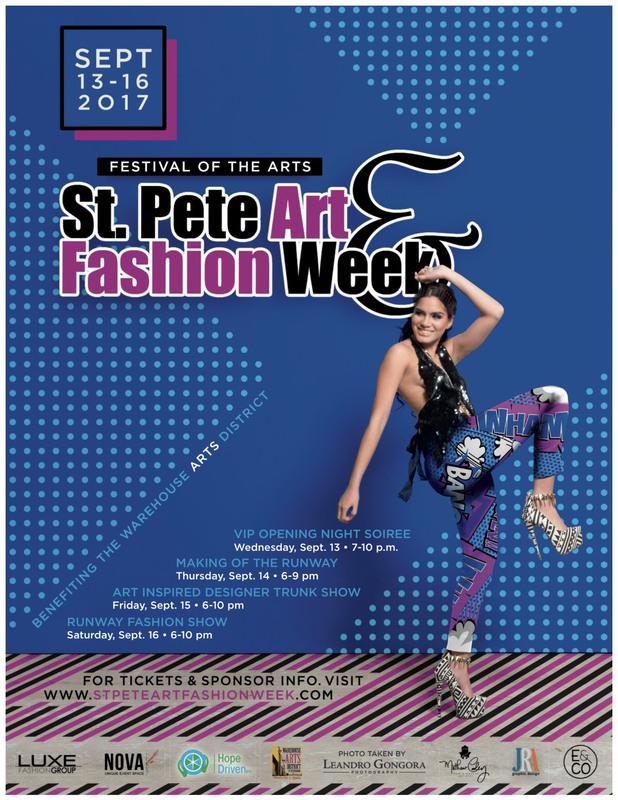 The goal of St. Pete Art & Fashion Week is to designate a week each year to celebrate our love for the city and those who make it so remarkable,” said Dona Crowley, founder of SPAFW. Tickets and a complete schedule of events is available online at www.StPeteArtandFashionWeek.com. St. Pete Art and Fashion Week was founded by Dona Crowley, a Tampa Bay resident and owner of Luxe Fashion Group. Some of our 2017 sponsors include Nova 535, The Raw Studios, JRA Graphic Design, Matthew Cooley, Leandro Gongora Photography, Multiplayer Agency, the Gallery, Tampa Style Magazine, Evolve & Co, and The Gallery. WAREHOUSE ARTS DISTRICT ASSOCIATION: The Warehouse Arts District Association in midtown St. Petersburg has emerged as a thriving economic artistic community. Educational efforts continue to build a knowledge of and appreciation for art accessible to everyone. In 2014, with the help of public and private donors, the Association purchased 2.7 acres of land along 22nd Street South and the Pinellas Trail. The project, now known as the ArtsX- change is comprised of six warehouse buildings that total more than 50,000 square feet of space. The next phase of fundraising — about $800,000 — is aimed toward the construction of around 28 studios that will be built on two levels inside the skin of one of the existing ware- houses. The studios will be self-supporting with stabilized rents helping to keep our artists in St. Pete as the district becomes more popular. The building will also include an incubator area and an event space that will offer gallery and gathering opportunities. This project is transfor- mational for the midtown area as blighted property becomes an inspirational arts destination!